Mediatrix of all graces, Mother of God, a compassionate and powerful Mother who loves the poor and all the people, who alleviates sufferings, who saves individuals and all mankind. Queen and Mother of all Nations, you came to rescue all those who seek refuge in you and allow yourself to be our guide by leading us to Jesus, the source of Eternal Life. Amen. 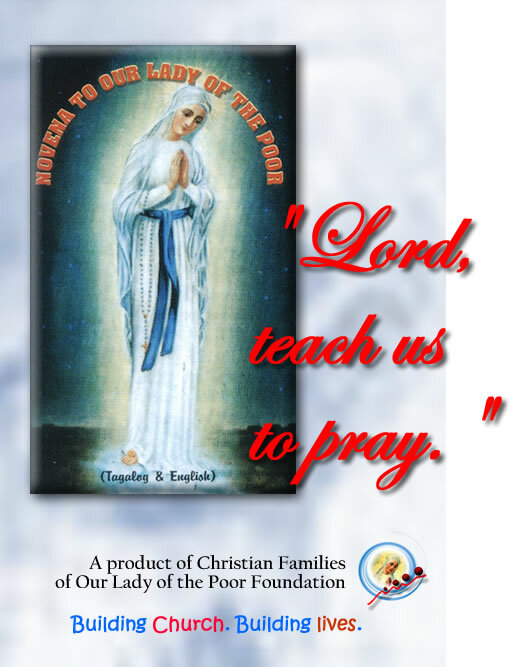 Our Lady of the Poor, we believe in you, May you believe in us. Lord Jesus Christ, true God and true Man, I am sorry for all the things I have done to you. You are my God, Lord and Father to us, I love you more than I treasure all the things in this world. I am heartily sorry for offending you and I resolve not to offend you again and I totally resign to your merciful love by confessing my sins. I earnestly hope that through your most adorable passion and dying on the cross, I may receive pardon and be included again to your Kingdom. Amen. O Virgin of the Poor, you invited me to go to the fountain and only source of holiness who is your Son, Jesus Christ. Teach me to follow the path of your Son with deep humility and lively faith. Help me to receive Him with all my strength and have the courage to die from my selfishness for the love of my neighbor. God the Father of heaven. Have mercy on us. God the Son, Redeemer of the world. Have mercy on us. God the Holy Spirit. Have mercy on us. Holy Trinity, One God. Have mercy on us. Virgin of the Poor. Lead us to Jesus, the fountain of grace. Virgin of the Poor. Save the whole world. Virgin of the Poor. Comfort the sick. Virgin of the Poor. Help those who are in misery. Virgin of the Poor Pray for each one of us. Virgin of the Poor We believe in you. Virgin of the Poor We fervently pray with deep humility. Virgin of the Poor. Bless us. Health of the Sick. Pray for us. Refuge of Sinners. Pray for us. Comforter of the Afflicted. Pray for us. Help of Christians Pray for us. of the world Hear us, O Lord. of the world Graciously hear us, O Lord. of the world. Have mercy on us. Our Lady of Banneux, Mother of God, Mother of the Redeemer, Virgin of the Poor, you deigned to have faith in you. You are our hope. Grant we beseech you to hear the prayers of your children according to the ineffable love and holy will bestowed upon you by your Son ( say your petition here). O Mary, Virgin of the Poor. Pray for us. O Virgin of the Poor, you invited me to go to the fountain and only source of holiness who is your Son, Jesus Christ. Teach me to follow the path of your Son with deep humility and lively faith. Help me to receive Him with all my strength and have the courage to die from my selfishness for the sake of your kingdom and for the love of my neighbor. O Mother of God, you worthily received the title being Virgin Mother of the Poor in the land of Banneux. Cleanse my heart of all allurements the world is offering. Grant me all the necessary graces especially for my salvation and may I recognize that all that I have comes from God. Teach me to accept with joy all the He will give me. Never allow me to be separated from His love but instead, I may come to Him because I believe He alone can satisfy my longing and of my salvation. O Virgin of the Poor, your message is for all the nations. From your message, you keep on asking your children to go to Jesus, your Son and our Brother, the source of holiness and salvation. Mercifully grant that we may be united as one family, brothers and sisters whose leader is no other than Jesus Christ. Grant me the grace to see Jesus, the perfect image of the Father, to others and to all. O Virgin of the Poor, you revealed to us the intention of building a small chapel in honor of the Holy Eucharist, the source of all grace. Teach me to come with deep faith and to love Jesus, truly present in the Eucharist. Help me to offer myself to the Father united with His Son, Jesus Christ, for the sanctification of the whole world. 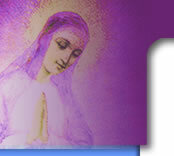 O Virgin of the Poor, you promised you would alleviate and ease the sufferings in this world. Grant, we beseech you, give me the strength to endure the difficulties I am now facing. Help me to realize the value of suffering and the fruits it bring. May it be a pleasing and worthy offering to your Son. Enlighten always my mind and find consolation amidst the sufferings and anxieties to my fellowmen by doing acts of charity and generosity towards them. O Virgin of the Poor, you said: “Believe in me. I will believe in you.” If my faith in Jesus Christ, your Son, is like a rock, then, our Lord will do great things for us. Holy Mother, our mother, grant me a lively and strong faith. Teach me always to remember that God is always before me, always present in the daily activities of life and grant me the grace to pray more with deep faith. O Virgin of the Poor, you have repeatedly reminded me to pray without ceasing. At Banneux, you earnestly taught the importance of prayer. That without prayer-Christian Community cannot be sustained. Holy Mother of God, teach me how to pray, teach me how to pray with devotion. Lead me always to source of grace, which is the Eucharist. As I participate in the breaking of the Heavenly Bread, I may have the courage and strength to live a holy life. Grant me to have the compassion to my fellowmen at be patient in dealing with them and I may find You always with them. O Virgin of the Poor, you showed yourself at Banneux as “Mother of the Redeemer, Mother of God.” As the Mother of the Redeemer, you came to us to ease our sufferings. Help us to understand that Jesus is Love and we in return should love our fellowmen. As the Mother of God, may your perfect example outshine within us. Mother Most Amiable, believe in us and we may believe in you. Kundi sa yo, saan pa kami tutungo? Maria, Ina ng mga dukha, aming Ina. Pag-isahin ang iyong mga anak. Lead us to Christ our Lord. Guide us to know what to say. And please God from up above. There’s joy ‘cause it’s Jesus we see!